The ease with which Theresa May was able to secure an early dissolution last week has led to suggestions that the Fixed-term Parliaments Act 2011 serves no useful purpose and should be scrapped. Drawing on wider evidence of how fixed-term parliaments legislation works in other countries, Robert Hazell argues that there is a danger that it is being judged prematurely, on the basis of a single episode. Future circumstances in which a Prime Minister seeks a dissolution may be different, and in these cases the Fixed-term Parliaments Act may serve as more of a constraint. Figure 1. 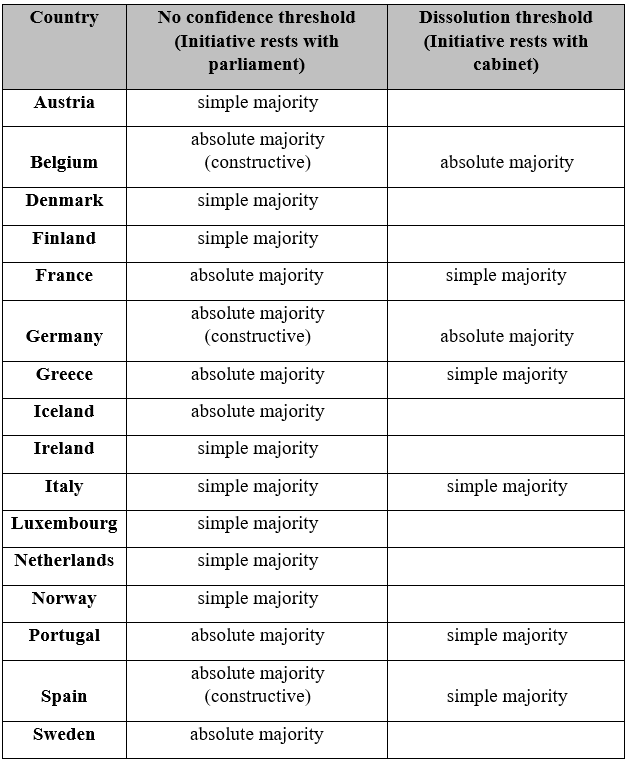 Source: K. Strøm et al, Delegation and Accountability in Parliamentary Democracy (Oxford: Oxford University Press, 2006), Table 4.12. What problem in the UK was the Fixed Term Act fixing? We did not have lots of short terms when the traditional system was in place did we? Or a series of scandals when Prime Ministers went to the Queen for dodgy reasons? The old system was understood by the public, had a nice ceremonial aspect that set off an election with a bang (live TV coverage of the PM going to the palace and all that) and was not being abused. The new way is not actually fixed, as we saw, and we see in other countries e.g. Germany has seen the government call No Confidence votes about itself etc. And the debate in parliament was a terrible way to start an election, I watched it for a bit and then turned it off, all the party political rubbish and attempt at jokes. This is not a better way and I want the old way back. Short correction: In Germany, the Bundestag cannot dissolve itself. A dissolution is only possible (i) after of a vote of no confidence in the Chancellor or (ii) when a Chancellor is elected with only a relative, not an absolute majority. In both cases (although there has not been a case (ii) dissolution yet), the ultimate decision to dissolve lies with the Bundespräsident, not with the Bundestag itself. This entry was posted on April 26, 2017 by Constitutional Law Group in Comparative law, UK government, UK Parliament and tagged Early General Election, Fixed Term Parliaments Act 2011, general election.